heart wrote: You kill, you go to hell. You ready to do that because you think it will be good for your cat, well then you are a brave man. This is karma, what you say make it seems like you think the work of serial killers and mass murders is compassion. Please tell me where on this thread I supported having a pet put down! Where did I say it would be good for the cat? Nowhere have I suggested it! How ignorant! How dare you tell me I think the work of serial killers and mass murderers is compassionate! What's the matter with you? That is how your argument sounds like in this thread, so if that isn't your opinion you are not doing so good. -- Dexing, if you didn't mean half of what you said, --and it seems you are doing a lot of backtracking and denying points you previously made-- claiming we misunderstood you or whatever-- then perhaps your attempts at communicating should be examined. I mean, there's a bunch of people that all seem to share the same impression of your posts, and no one seems to have read things the way you are claiming they should have been read. Adamantine wrote: First off, in your original post about this you never left any conditional that you were speaking about Buddhists, you said "people". We're on a Buddhist forum, talking about a decision a Buddhist will be making, and giving Buddhist advice. Why would you think otherwise? I said; "Will it relieve suffering forever? Maybe not, but..."
That means "granted". An example sentence; "Maybe it won't rain everyday, but I still carry my umbrella just in case". That "maybe" means "granted". Why the hell would I be on the fence about whether or not killing something will relieve it's suffering forever? 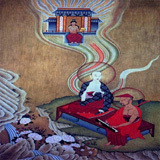 Jangchup Donden wrote: Just because something may have the karmic potential to be killed by us doesn't mean that killing it is not going to generate negative karma. If we don't kill it, the karmic potential for other ways of dying are still there. So if we kill something, it still has to suffer through the results of other karmic ways of dying. No sh!t..... Who ever argued against these things to you? Every new post you make is even more ignorant than the last. I don't even know who you are having a discussion with. heart wrote: That is how your argument sounds like in this thread, so if that isn't your opinion you are not doing so good. Magnus, I can tell from your first post that you are not a native English speaker. So I don't expect as much from you as I would these other guys, who seem to be native speakers, but must have American educations. People can & will pray for the cat, specially if you upload a photo here or on imageshack, what's her name? Will it relieve suffering forever? Maybe not, but by your logic assuming that it won't is also an assumption based on ignorance, unless you claim to know for certain that what the Buddhist scriptures say will happen after death will actually happen, as direct knowledge, rather than faith. So the "maybe not" precluded the latter part where you implied that Buddhist scriptures were not based on valid knowledge (you pin these against "direct knowledge", as if that wasn't their basis) and then clearly imply I am speaking out of faith-- in this context it is clear you mean blind faith. All this after stating that by "my logic" my experience and knowledge based on Buddhist teachers, teachings, and direct experience are all based on ignorance. I never exerted any so called "logic" that would even remotely imply this, so I can only assume this is your own logic you are projecting upon me. And so I can only assume that I am not talking to a Buddhist. If you are a Buddhist, I have to say you're not doing a great job at communicating Buddhist ethics, as Magnus pointed out. And maybe english is not his first language but I've been in dialogue with him for many years now and I haven't had a hard time understanding him, and I don't believe I've ever seen him have a hard time understanding others on these forums. So you must be special! So the "maybe not" precluded the latter part where you implied that Buddhist scriptures were not based on valid knowledge (you pin these against "direct knowledge", as if that wasn't their basis) and then clearly imply I am speaking out of faith-- in this context it is clear you mean blind faith. What do you mean "actually"? Which part implies that Buddhist scriptures were not based on valid knowledge? I was obviously speaking directly to you about your experience of what is taught in the scriptures. If you claim to know for certain what happens after death, then it must be from some sort of direct knowledge, not just reasonable deduction and faith in scripture and teachers' word. Otherwise you can't claim it as "knowledge". This is talking about you, not scriptures or their author- the Buddha. So when I said "maybe not", it meant "granted" that's the standard Buddhist teaching, but you still can't claim "knowledge" of something like the afterlife unless you have direct experience of it. You are just as ignorant or even dishonest if you dare to do so. Dexing, I have a hard time following your convoluted attempts at reasoning, and it seems I am not the only one. Just giving you the benefit of the doubt that everything you've tried to explain in your last post is what you originally meant in the earlier post-- then you are still claiming that direct experience is the only form of valid knowledge. In actuality, as samsaric deluded beings-- from a Buddhist POV most of our so-called "direct experiences" are considered delusional since they are experienced through the mire of obscuration and afflictive emotions. To have faith in our direct experience over the experience of Buddhas is still a faith, but the faith is misplaced. Otherwise, why bother with Buddhism? I have had direct experiences with the dying, with the dead (corpses), and the after-dead. I wouldn't bother to describe them here because they are both personal and because it's not going to convince you of anything anyway. I can not prove to you or anyone my own experience. I've also had direct experiences as well as accounts of psychics and traditional Tibetan divination that all corresponded regarding the same thing related to a previous life. But I would never unfold the details of these things just to prove something in debate. Then, there are a very large number of first-hand accounts studied by Dr. Ian Stevenson among others-- including my own Lamas who are highly trustworthy and have no reason to fabricate anything. As I pointed out before, knowledge through inference is considered a valid form of knowledge in Buddhist philosophy. This is because without using inference, we wouldn't be able to live, as in --seeing smoke you know there is fire. Where you get the idea that "direct experience" is the only acceptable form of valid knowledge is beyond me, but again it is certainly not a Buddhist approach. So I still wonder if you are a Buddhist. Are you? Adamantine wrote: Just giving you the benefit of the doubt that everything you've tried to explain in your last post is what you originally meant in the earlier post-- then you are still claiming that direct experience is the only form of valid knowledge. Of course I am not. I have always said "claims of knowing what happens after death" must be supported by direct experience, rather than just trusting logic of scriptures and teachers' word. If you have not had such direct experience, then you cannot claim knowledge of afterlife however plausible it is. However, you must also be able to distinguish fact from hallucination, which means it must actually align with reality. Obviously inferential knowledge, like smoke being indicative of fire, is only considered valid knowledge because it manifests in observable, testable, and verifiable reality. In actuality, as samsaric deluded beings-- from a Buddhist POV most of our so-called "direct experiences" are considered delusional since they are experienced through the mire of obscuration and afflictive emotions. To have faith in our direct experience over the experience of Buddhas is still a faith, but the faith is misplaced. Otherwise, why bother with Buddhism? If such is the case then why have such faith in your own experience, and call your experience "knowledge"? Because you're "not the only one"? Plenty of Christians make the same kind of claims about their creator god, their direct experience of him and scores of others who claim the same experience. They also have NDE case studies to support their theory. Is that valid knowledge? What makes your case different? Adamantine wrote: Plenty of Christians make the same kind of claims about their creator god, their direct experience of him and scores of others who claim the same experience. They also have NDE case studies to support their theory. Is that valid knowledge? What makes your case different? hahaha come on man, you're being so silly. Are you not even aware? I alluded to some personal experiences, you have no idea what they are, but I alluded to them with the conditional that you wouldn't be satisfied- because I knew that exactly what you were demanding, so called -direct experience- wouldn't satisfy you-- even though that was your purported indicator of valid knowledge. And now you're pedantically asking me "is that valid knowledge?" and comparing it to Christian experiences. SO you're attacking your own point, not mine. Having a meaningful dialogue with you seems unlikely, so for now I will bow out. There's trust in experts. You don't need to be a doctor to take a prescribed drug. Plus, death is a deluded experience as is life. You can have knowledge about death while living. 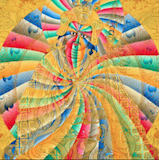 Padmasambhava's teachings on the six bardos come to mind. You practice them while you are alive. Define reality, testable and verifiable, if you please. Buddhist experts consider their experiences real, testable and verifiable. The thing is that you must verify them by yourself and perhaps that's the most reliable form of verification. The fact that one can't verify something in a 3rd person perspective doesn't mean it isn't real. I'm thinking of an apple right now and there's no way on Earth you can't verify that from a 3rd person perspective. Does that mean I can't think of an apple? I say anyone in his perfect sense can distinguish fact from hallucination. AFAIK, a great number of people appearing mentally healthy describe experiences considered hallucinations by another great number of people who also appear to be healthy. So it must be something else. It's experience that should define theory and not the other way around. We recognize the wisdom of others, those considered trustworthy. My experience is that the sun revolves around the Earth. Yet, experts in cosmology proved otherwise. They are trustworth regarding this field of knowledge. If I do what they say, I'll be proven wrong and they right. My experience may lead me to think that the state of shamatha is enlightenment. Buddhist experts prove me otherwise. If I follow their advice, I'll see they are right. Regarding death and after death matters the experts whose opinion I trust are Buddhist. Regarding cosmology, are Astrophysicists. The view, meaning the interpretation you make from a certain experience and the narrative you build around it. The better view will lead you to further experience, more and more clear and deep. More basic views will allow you only so much. You may wrongly interpret some of the qualities of the natural state as being God's qualities. You'll get stuck there if the view isn't corrected. If you do correct it you'll progress further. This is why the view is both the beginning and the end of the path. So his case is different because his view is superior to the eternalist view of Christians. More adequate, if you prefer. If you take some time to improve your reading comprehension skills, you will notice I didn't say direct experience alone is valid knowledge. It must also be able to manifest in reality. Unlike the man in the insane asylum I mentioned earlier in the thread who's direct experience tells him that he is Napoleon. He has this direct experience, as do the Christians concerning their creator god, but it needs to be validated. How come you only need your direct experience, but they require more? So to claim knowledge, on one hand you need direct experience of what you are claiming, and on the other you need to demonstrate that this aligns with reality. As Adamantine seems to have bowed out, let me give you a plausible answer. You can classify phenomena in several categories which go till very hidden phenomena. Still, even this last kind can be verified by experts. If we were talking about physics, for instance, if someone says there are planets orbiting stars beyond our solar system, it won't be the average Joe that can refute or confirm this. You'll need and expert who can collect and interpret data. Agree? So, if we talk about subtle phenomena like what happens after death, we are talking about something that not everyone can verify at this moment. Let's assume Adamantine described one of his experiences. To refute it or confirm it, we would need an expert meditator. So these subtle phenomena manifest in reality, still not at a level that we all can easily see. We need training to confirm or refute them, that's all. Now let's assume Adamantine says that hares have horns. You won't need an expert to say that there's no such thing. Of course there's the possibility of somewhere in a hidden forest there are hares with horns, although quite unlikely as there doesn't seem to be any evolutive advantage about it neither their ancestors had them... nevertheless in some special environment due to a series of mutations such characteristic could be selected. Still, it's something we could all see easily. It's not a very hidden phenomena. I don't need a doctoral degree to confirm or refute this, neither do I need to be an expert meditator. I just need to see one and know it's not a fake. Now, if I claim to be Napoleon, that's not a very hidden phenomena. Napoloeon or Jesus or whomever you decide to choose are dead. If I say I'm one of them, it's obvious that I'm not. No training is needed to confirm or refute it. Answering directly to your question, this is why "they" require more. One doesn't need to be an expert to dismiss these claims. So the difference lies in the class of phenomena we're talking about. To verify some one needs years of training while others anyone can verify without specific training. So on one hand Adamantine would have direct experience and on the other the phenomenon indeed aligns with reality. The fact is that there are aspects of reality that aren't easily accessible to everyone. Knowing this difference would be enough for you to answer your own question. You asked a question that had no need to be asked because your premise assumed all phenomena having equal degrees of subtlety while, in fact, they don't. This goes for Buddhism or Science. In the end it's a matter of verification. Even very hidden phenomena may be verified when one was the necessary qualifications. This also goes both for Buddhism and Science. The problem is that people who tend to prefer a "lite" version of Buddhism also seem to show some preference for a "lite" version of science (a kind of pop science pseudo skeptics seem to love), which utterly disregards philosophy of science. Confusion is expected when both meet. I read it, but it doesn't talk about whether or not a being can be killed by another irrespective of their past karma, as you suggested. If a beings karma personal was the only factor involved in their death, then the killer wouldn't be able make a volitional action to kill that being. If that was the case then there would never be any karma created for killing a being. The Buddha said in the SN quote that karma is created by volitional actions, so the volition of the killer also plays a part in the death of a dying being, unless you want to say that you can never create karma from killing. Oh my god, dude... Are you being serious or just trolling me? When did I say it is the only factor?? I did say it is definitely an essential factor. It must be! You are speaking as if it is possible for the killers' volitional action to be the only factor! I'm saying if that were so, Devadatta would not have failed in his attempts to kill the Buddha. But the Buddha lacked such negative karma to be killed, so the attempts were bungled despite Devadatta's intention and repeated attempts. Unless I'm incorrect, we were discussing this in the context of euthanizing a pet. Just because something may have the karmic potential to be killed by us doesn't mean that killing it is not going to generate negative karma. If we don't kill it, the karmic potential for other ways of dying are still there. So if we kill something, it still has to suffer through the results of other karmic ways of dying. In the case of the Buddha, it could also have been Devadatta's karma that prevented him from killing the Buddha. Maybe it was both? How am I not responding to you in this discussion? How are my posts more ignorant? They seem to be talking to what you've talked about, and I quote what I'm responding to you in your messages. Not quite sure where your confusion is coming from. Because you keep arguing against things I've never said, like that "one cannot create new present karma", or that "a being's past karma is the only factor in how it dies". Saying a being needs to have the negative karma to result in being killed by another does not at all mean the killer doesn't need to make an intentional act to kill. Jangchup Donden wrote: Funny thing is you did ask about being the only factor, saying it was irrespective of anything else. Yeah, that is funny. Where did I say that??? I said you were speaking as if a being can be killed solely as a result of the killer's intentional action, irrespective of the being's past karma. But both factors must be present! With only one or the other, it won't work. Just because something may have the karmic potential to be killed by us doesn't mean that killing it is not going to generate negative karma. So why the heck did you say this if you're talking to me? When did I say killing won't generate negative karma? Is this not an ignorant thing for you to say?